This weekend, I decided I could not put off a huge trip to Costco any longer. I am much poorer in dollars now, but much richer in food! I tried to exercise some restraint, so I pretty much bought only food this time, resisting the temptation to buy all the household goods, outdoor paraphernalia and assorted deals they have throughout the warehouse. 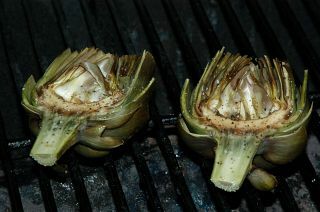 I did get bratwurst and artichokes for a good BBQ, though. It is a good thing we BBQ’d last night, too, because as I type this, it is pouring outside. Not that I am complaining–we need the rain, it has been so dry here lately. My garden and fig trees are going to be very happy with this deluge. I have some garden using tasks I didn’t get done this weekend that I will need to do during the week. I made all those great plans for the lavender and did exactly nothing there, and it is time to take all of the garlic scapes off the garlic plants. I have been using some scapes, but I will have a lot to use at once, so I foresee a big batch of garlic scape pesto in my near future.